Soon after getting a job as a dishwasher in a large professional kitchen in 1989, I knew it wouldn't be long before I was on the other side of the line preparing those beautiful plates of food that were so painstakingly assembled. As fate would have it, the chef placed me on the line in the position of garde' manger (a fancy name for salad and appetizer cook). From that point on, I knew this profession was to be my future. While working as sous chef in a country club, I graduated culinary school earning a degree and a SERVSAFE certification(the National Restaurant Association's course on sanitation and food sefety). Over the next eight years I held positions from saute' cook to head chef learning ice and snow sculpting in my spare time. 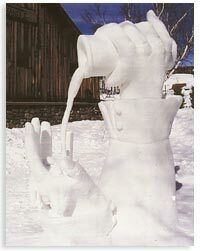 An eight foot snow sculpture on your front lawn makes a unique valentine's day gift! Using my skills to help people enjoy themselves a little more isn't the only reason I've decided to become a personal chef. If I can afford people more time with their loved ones by taking some of the burden off their hectic lives than I have succeeded in reaching my goal.